Mausoleum of Hadrian Now the "Castel Sant'Angelo"
System cut stone bearing masonry. In the form of a huge cylinder. Castel Sant'Angelo from the bridge. The angel statue on the top gives the name to the building. 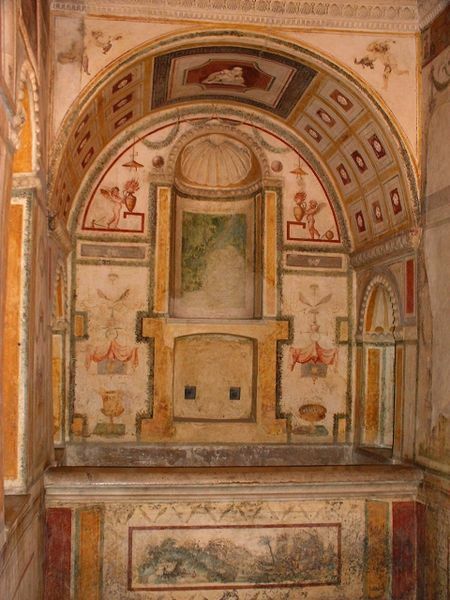 Bathroom of Pope Clement VII. 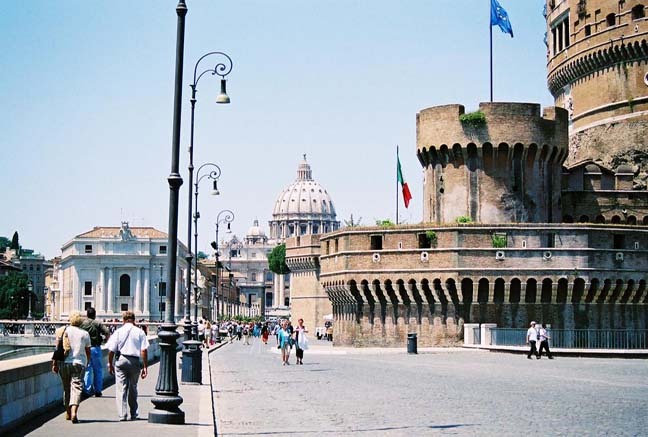 The Castel Sant'Angelo is towering cylindrical building in Rome, initially commissioned by the Roman Emperor Hadrian as a mausoleum for himself and his family. The building spent over a thousand years as a fortress and castle, and is now a museum. The Tomb of Hadrian was erected on the right bank of the Tiber, between 135 and 139. Originally, the mausoleum was a decorated cylinder, with a garden top and the golden quadriga of the emperor. Hadrian's ashes were placed here a year after his death in Baiae in 138, together with those of his wife Sabina, and his first adopted son, Lucius Aelius, who also died in 138. Following this, the remains of succeeding emperors were also placed here, the last recorded deposition being Caracalla in 217. The urns containing these ashes were probably placed in what is now known as the Treasury room deep within the building, but the urns and the ashes are long since gone, scattered by Visigoth looters when Alaric sacked Rome in 410. In 401, the mausoleum was converted into a military fortress and included by Flavius Augustus Honorius in the Aurelian Walls. Procopius recounts that during the siege by the Goths in 537, the bronze and stone statuary that originally decorated the tomb-become-fortress were thrown down upon the attackers. The popes converted the structure into a castle, from the 14th century; Pope Nicholas III connected the castle to St. Peter's Basilica by a covered fortified corridor called the Passetto di Borgo. 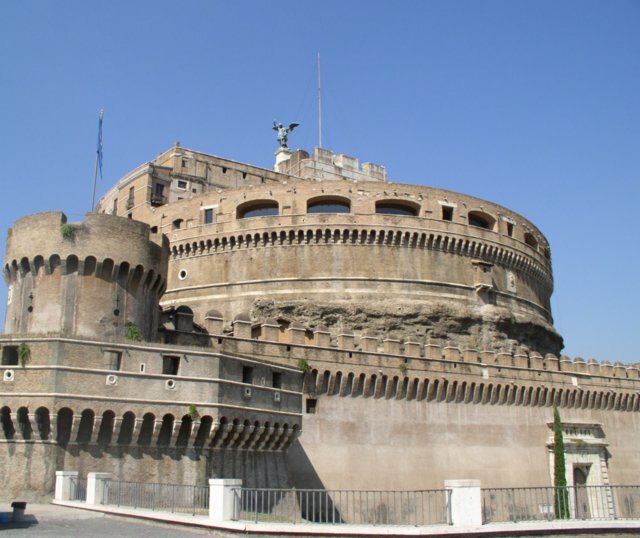 The fortress was the refuge of Pope Clement VII from the siege of Charles V's Landsknecht during the Sack of Rome (1527), in which Benvenuto Cellini describes strolling the ramparts and shooting enemy soldiers. The Papal state also used Sant'Angelo as a prison; Giordano Bruno, for example, was imprisoned there for six years. As a prison, it was also the setting of Giacomo Puccini's Tosca from whose ramparts the namesake of the opera leaps to her death. An 18th century bronze statue of Saint Michael the archangel sheathing a sword surmounts the tomb; legend holds that an angel appeared atop of the mausoleum, sheathing his sword as a sign of the end of the plague of 590, thus lending the castle its present name. 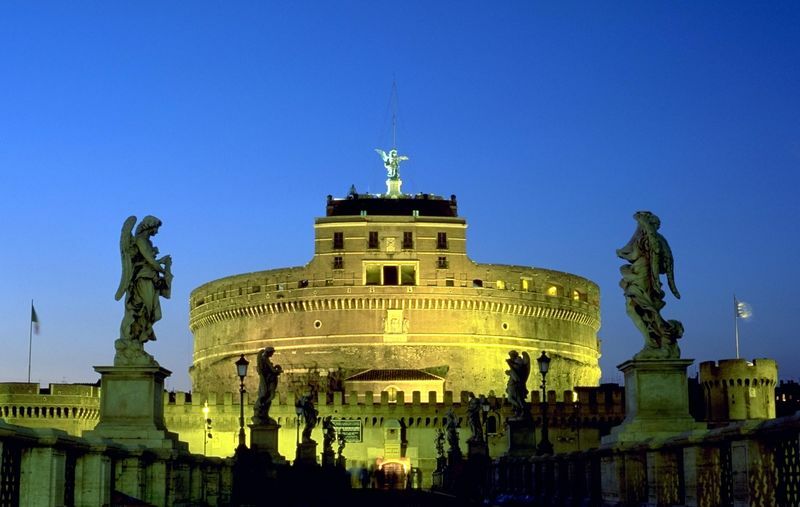 Decommissioned at last in 1901, the photogenic castle is now a museum, Museo Nazionale di Castel Sant'Angelo. The Ponte Sant'Angelo, providing a scenic approach from the center of Rome and the right bank of the Tiber, dates also from Imperial Rome and is renowned for its Baroque statuary of angels holding aloft elements of the Passion of Christ.